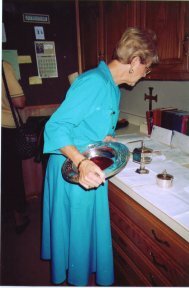 This ministry includes the set up/clean up for Sunday and weekday Eucharists, baptisms, weddings, funerals, the preparations associated with the seasons of the church year, the care/laundry of linens, and the cleaning of the silver and brass items in the church and the chapel. Any adult church member can be part of this work. Training and a handbook are provided, and once you are trained you will be scheduled to serve at least once a month, for either the 8:00 or the 10:00 service. To join the Altar Guild or learn more about it, click here.